December 6, 2018 By Lori 10 Comments THIS POST MAY CONTAIN AFFILIATE LINKS. PLEASE READ MY DISCLOSURE HERE. The dinner solution to HANGRY and LIGHT. Fast, loaded with flavor and better than takeout any day because you know what’s in it! 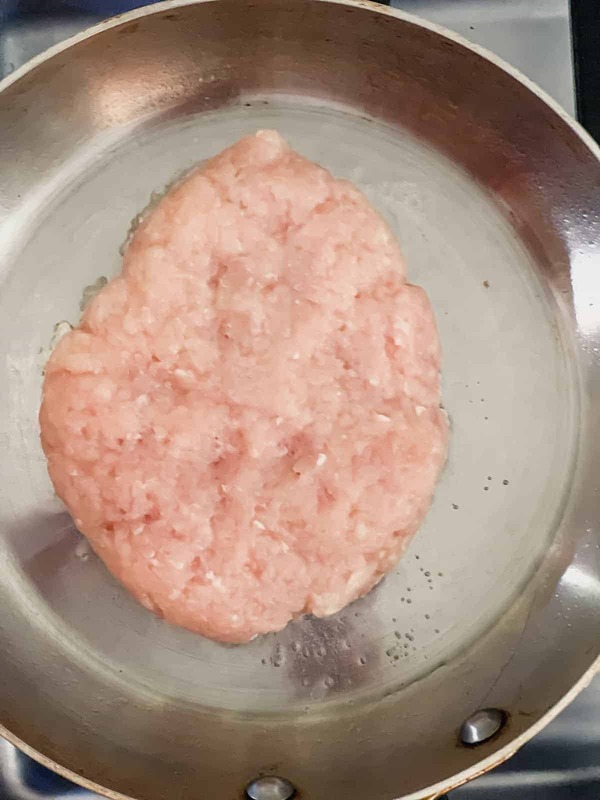 The only thing that might be a little difficult to find with this recipe is the ground chicken. If you like your butcher and they’ll grind your chicken breasts fresh, by all means do that. Otherwise, a package from the store is totally great. One other disclaimer: make sure you wash your hands frequently before and after handling the chicken. There’s my PSA on that. For the rest of the ingredients, while it’s a lengthy list, once you buy them, you’ll use them over and over because you’ll be craving this ALOT. And I do have a cheater version of the recipe below if you want to go that route as well. Heat a skillet with a little olive oil and swirl it around. Brown your chicken until it loses the pink color. Meanwhile, mix all the sauce ingredients up (or if you’re using the cheater version, you’ll skip this step). After the chicken is browned, pour the sauce over and simmer the chicken in the sauce for a few minutes until thickened. The filling can be made ahead at this point and refrigerated. 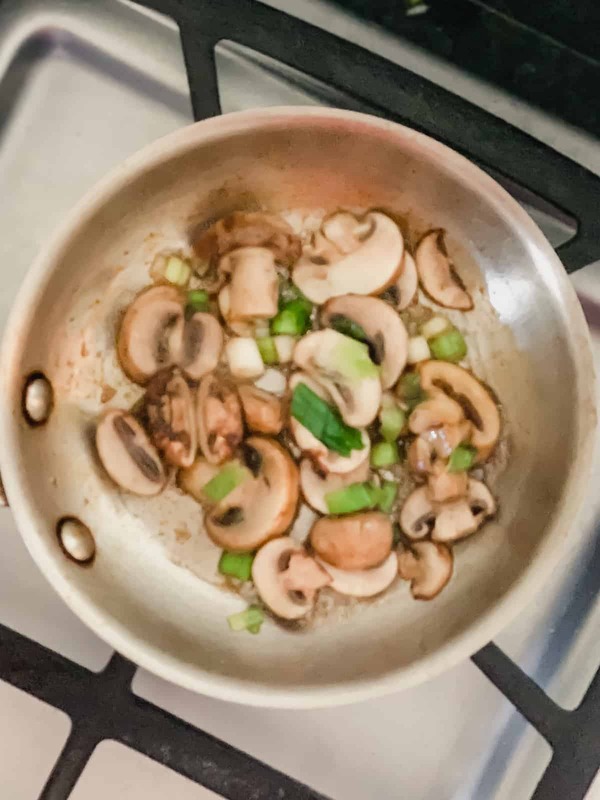 My other favorite thing to serve with this is sauteed mushrooms and onions. It adds a hit of meaty umami that takes the dish to another level. You could even add your favorite pepper because it definitely benefits from a hit of heat. 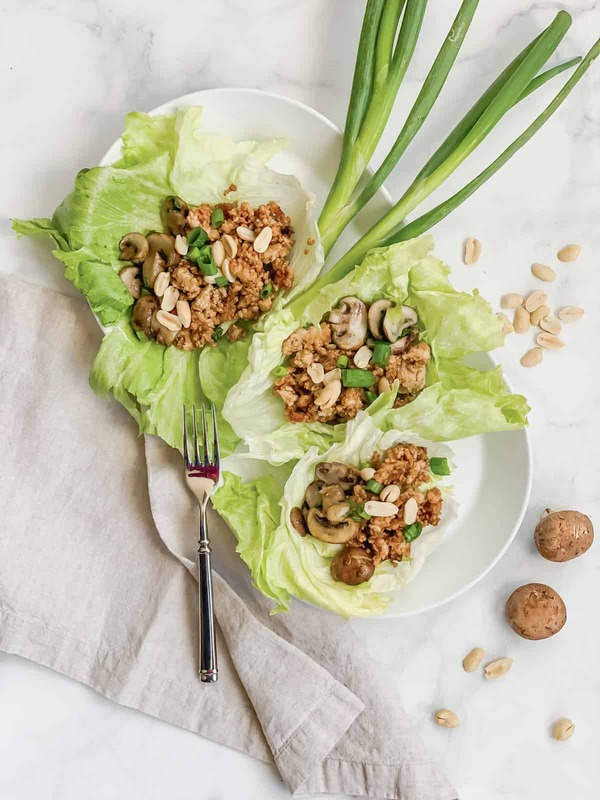 Make sure your lettuce is all washed and ready and your condiments like the Avocado Cilantro Everything Sauce, more fresh cilantro, cut limes, crushed red pepper and peanuts are ready to go because as soon as these are ready, your group will be clamoring for them. Load up the lettuce and top with your choice of toppings. Oh yeah – we sometimes skip the lettuce and eat them as bowls with roasted broccoli and edamame. So good! Let me know in the comments if you try them! increase chicken and sauce ingredients by about 1.5 for every two people. 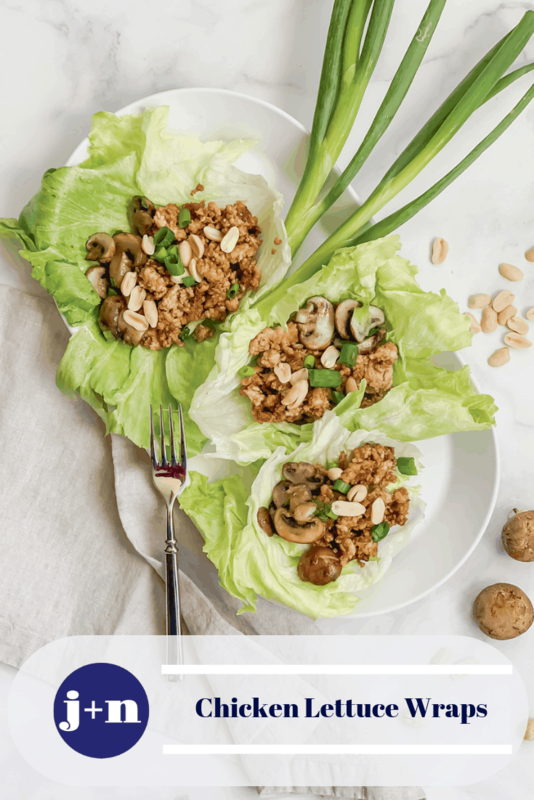 Use Trader Joe’s Soyaki Sauce (along with the peanut butter and cornstarch) as a substitute for most of the sauce ingredients listed before the chicken. The flavors aren’t as layered but it takes up a lot less room in your fridge, saves time and money! The dinner solution for light and HANGRY. A quick mealtime solution that can be easily adjusted for a crowd. 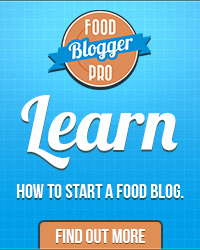 Combine soy sauce and cornstarch together in a small bowl or measuring cup. Note: If using simple version: mix cornstarch and peanut butter in with the Soyaki Sauce and skip to step #3. Add the next five ingredients and lightly stir to incorporate. Meanwhile, heat canola oil in a large skillet over medium high heat until hot. Add chicken. Cook chicken until browned, about 10 minutes. Drain any grease or excess water from the pan if needed. Add the green onion and a pinch of crushed red pepper if using. Add sauce mix (or Soyaki Sauce, if using) and simmer gently for about 5 minutes to blend the flavors. Assemble the wraps by taking a piece of lettuce and adding about 1/4-1/2 cup of meat mixture to wrap. Garnish with favorite toppings. Such an easy week night dinner that I always look forward to! Need to try the TJ hack…. It’s a good one- especially for a quick weeknight dinner. 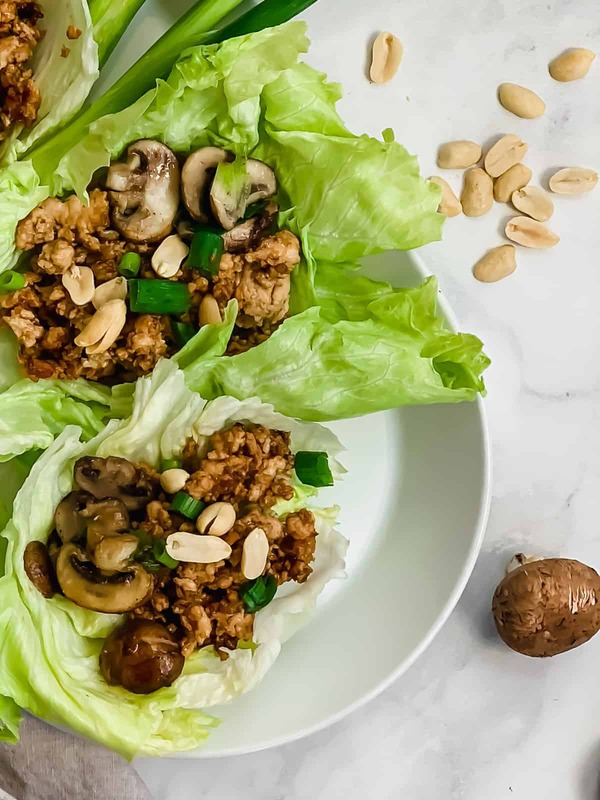 This is a fun but healthy dinner option! Love these! Thanks Vick! My family loves them! Made the lettuce wraps last night with the TJ hack! Loved and was so easy. I did dice up some shiitake mushrooms and added to the chicken when I added the onions, delicious! Made and used the avocado everything sauce as well, perfect combo. Will be making again. Thanks Lynda! So happy you and the family enjoyed them. And glad you tried the simple version – I did adjust the recipe to keep the cornstarch and peanut butter in -thanks so much for the feedback! If these are on the menu they are my go to! Now I can make at home. Yay Melissa! I do love not having to leave the house to pick up the carryout especially in the cold weather/ Enjoy and let me know how you like them! I have made this recipe a few times and passed it on to a few friends as well! It is quick, easy and delicious. I usually always double the recipe to serve my family of 4. 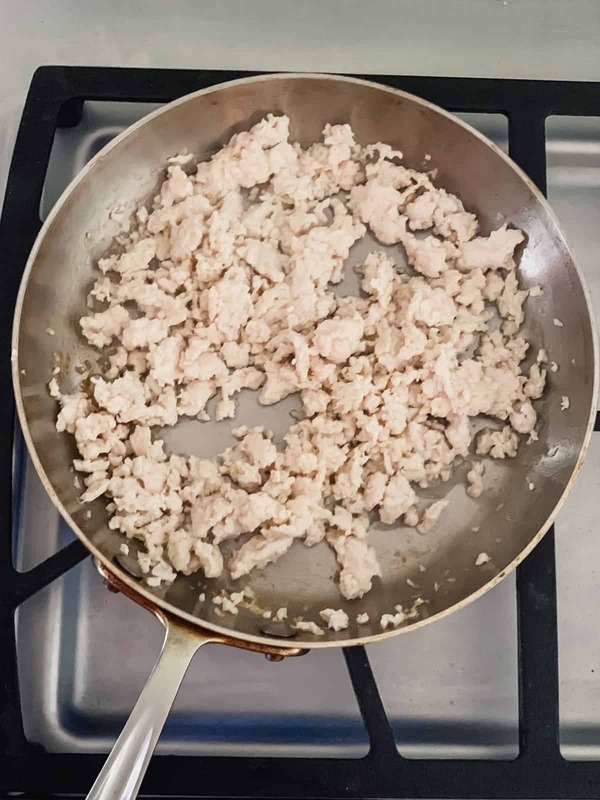 I think next time I will use 4lbs of ground chicken and freeze half for a future meal or divide into smaller portions for a quick meal when we are on the go. I also add a can of chopped water chestnuts to add a crunch. This makes me SO happy!☺️ Water chestnuts are a great addition! I have doubled it as well and freezing it makes for a great weeknight meal. Thanks so much for sharing!